Inspired by a display at the Royal Agricultural show I decided to buy numerous water loving plants to help clear the water in my goldfish pond. Most things seemed to die in time, so when my watercress was on its seemingly last legs I put it in the bird bath to revive it. 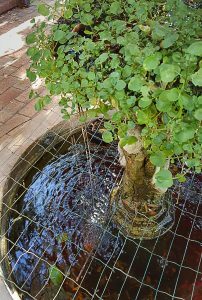 As you can see it thrived has now taken over the birdbath (sorry birds) and purifies the water from the pond for the goldfish and the best part is we have fresh watercress for most of the year.